1. Sushi Sushi is the story of two sushi buddies, an egg and salmon sushi, the two most common types of sushi. 2. The salmon sushi’s name is Sasuki. He was born in Japan and enjoys indoor activities. His ultimate hobby? Pampering himself at the spa with a relaxing wasabi mask and shoyu hot tub. 3. Edward, the egg sushi, was born in the US. He’s a hyper clump of rice who enjoys the outdoors. Edward’s favorite sport is most definitely surfing. 4. Sasuki and Edward met each other at a sushi shop. They are now attending school in Chicago, studying illustration. They still work part-time at the local sushi shop. 5. Their philosophy: There will be hard times and there will be good times. That is life. So be positive and enjoy it. Life is short. Work hard and play hard. We could all use a little Sushi Sushi in our lives. So make sure to download the pack in the WeChat sticker gallery. 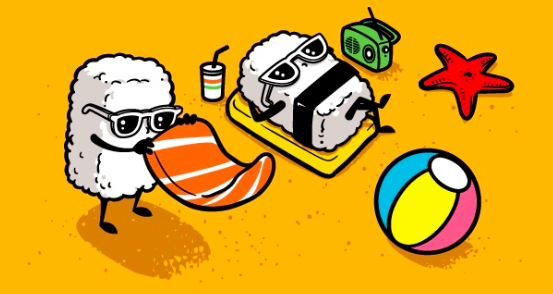 You can even purchase a t-shirt featuring your favorite sushi buddies here.